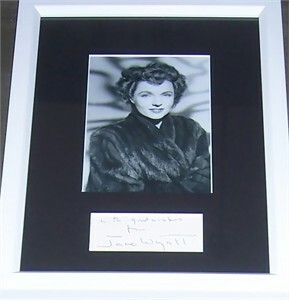 Black ballpoint signature on white paper signed by the late, great actress Jane Wyatt of Father Knows Best fame (she added with good wishes to her signature), professionally matted with a vintage 5x7 photo and framed with glass in white, ready to hang. ONLY ONE AVAILABLE FOR SALE. With certificate of authenticity from AutographsForSale.com.